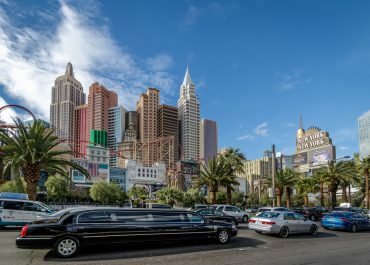 Limousine Service - LA to Las Vegas and other long trips..
We often get calls for long trips to places like Las Vegas or the Palm Springs area. Callers are looking for all different types of vehicles and it always brings up the same types of issues. There are basically two types of services requested for these long hauls and neither of them are cheap. The first and most common is when the client want’s us to take them one way and drop them off at a location in the dessert or somewhere else. This is all well and good until the driver drops the client and now must return home without a client in the car. This means someone is going to have to pay for that time and distance and it either us or you (the client). We love you very much, however we can’t lose money on these trips or we won’t be in business for long. Faced with this dilemma, we have two options, 1. Is to build the cost of the return into the price of the one-way. 2. Is to charge for the empty, return trip. Neither of those sounds very good to the client but we haven’t come up with any other way at this point. The second scenario is when the client want’s us to take them on a long haul then bring them back to their starting point. This is easy when the guest will only be at the destination for a short time such as a few hours. We simply charge an hourly rate for the wait time. It gets a little more complex when there is an overnight. The booking of the lodging for the driver can be acquired by either you (the client) or Hollywood Town Car and Limousine. Note: When booking an overnight for the driver, it is best to have the driver stay at the same hotel at which you will be staying so that if you need to driver on short notice, he or she will be close by. In this case, we will either need to send a second vehicle and driver or the driver will need to secure lodging for the night. We are more than happy to accommodate you in this case but of course it all runs into money. The bottom line is this, on long hauls, we have policies in place to ensure that you get the type of service you are used to and we can continue to deliver that service to you in the comfort and style you have grown accustomed to. One way transfers will be offered at a flat rate for the initial trip and the empty return will be billed at our standard hourly rate. Round trips without extended wait time will be billed at a flat rate for each way with standard hourly rates for wait time at the destination. Each leg of the “long haul” will be billed at a flat rate. Lodging for the driver can either be acquired by the client or by Hollywood Town Car and Limousine and will be billed at the actual rate plus $100.00 per diem for the driver. Additional transportation at the destination city will be billed at our standard hourly rates with a 2 hour minimum. (When you ask the driver to come get you at your hotel and take you to a separate destination within area).